"Listen to Living It Up tomorrow at 1pm ct on http://www.blogtalkradio.com/mstra-thatgem !" Diamonds and Gents guess who showed up to Fashion Week in New York with a baby bump. That's right Lil Kim this will be the rapper 1st baby. Now some stories say that the baby father is Mr. Papers the rapper. What makes us come with that conclusion? Mr. Papers is tweeting it and IS ON Instragram WITH IT. Taking full credit for the new baby. 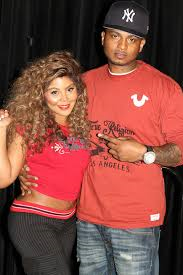 Lil Kim hasn't said who her baby father is. So needless to say there hasn't been any denying it either. All we have to say over at Team that Gem is congrats! What you think? Is Mr. Papers trying to be more then a New York based rapper and want mainstream? Or is he really the Father?